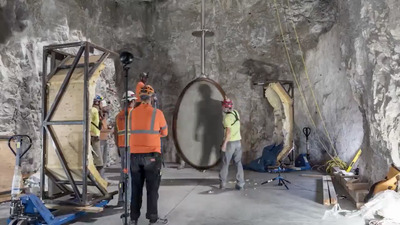 Amazon CEO Jeff Bezos has funded the construction of a clock buried in a mountain in Texas that’s designed to keep time for 10,000 years. The clock is a project of the Long Now Foundation. Bezos shared a video of the clock’s construction on Tuesday. Amazon CEO Jeff Bezos spends his fortune on a lot of interesting projects, such as The Washington Post, Blue Origin, and giant historical mansions. But his most quixotic project may be the “10,000 year clock,” in which he is funding the construction of a clock in the West Texas desert that’s designed to keep time for millennia. “Installation has begun – 500 ft tall, all mechanical, powered by day/night thermal cycles, synchronised at solar noon, a symbol for long-term thinking – the #10000YearClock is coming together thx to the genius of Danny Hillis, Zander Rose & the whole Clock team! Enjoy the video,” Bezos tweeted. Bezos isn’t the brain behind the clock, he’s just a backer, to the tune of $US42 million ($AU53 million). The clock is a project of a San Francisco-based group called The Long Now foundation, founded by Danny Hillis, according to a Wired profile of the clock from 2012. 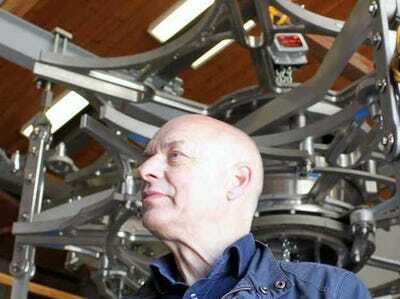 Long NowBrian Eno inspects clock mechanics. The clock is powered by a large weight hanging on a gear, and is designed out of durable materials so that it may continue keeping time for centuries. It’s also buried 500 feet into a Texas mountain. Bezos is personally invested in the project because of his belief that humans need to plan for beyond our lifetimes. “We humans have become so technologically sophisticated that in certain ways we’re dangerous to ourselves. It’s going to be increasingly important over time for humanity to take a longer-term view of its future,” he told The Wall Street Journal in 2012. Bezos isn’t the only notable person involved in the construction of the giant clock. Musician Brian Eno and notable tech writers Kevin Kelly and Stewart Brand are involved in the clock’s construction as well.